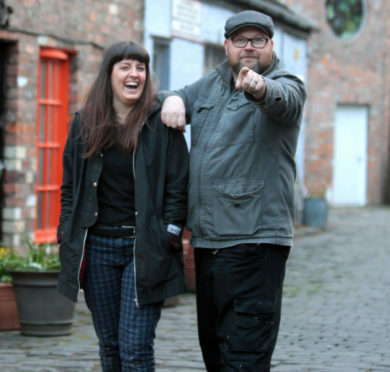 Kate Clifford and Scott McIntyre from Vanilla Ink. The Smiddy in Banff is now home to the centre of excellence for silversmithing and jewellery. The revamp of the once-derelict building has taken around six months to complete and it is hoped the move will resurrect the historic activity in the coastal community. Banff Conservation Area Regeneration Scheme, Creative Scotland, the Scottish Government, Historic Environment Scotland and the council helped get the project off the ground. Around 200 years ago, Banff was a thriving centre for silversmithing and even had its very own assay mark. At one point, there were 24 silversmiths working in the town. Two new staff members, silversmith Megan Falconer and workshop coordinator Alison Arrowsmith, have been employed to work at the Bridge Street base. It will offer classes and workshops and officuials are confident it will attract visitors to the Moray Firth town. Aberdeenshire’s Provost Bill Howatson did the honours yesterday to launch the new project. He argued it would show other fledgling businesses what can be done and assist Banff’s wider regeneration effort. Mr Howatson said: “This is an exciting project which will certainly pave the way for start-ups in the future. “Banff has a strong history of artisan skills, and the re-birth of silversmithing gives the town a unique offering. This will generate economic activity and increase awareness of Banff and all it has to offer. The Smiddy is being operated by Glasgow-based jewellery school Vanilla Ink. Founder Kate Pickering said she just wants locals to come in and see it for themselves. She added: “The past few weeks and months have been exciting, as we put the finishing touches to our programme and build a team around us. “Initial interest in our project has been really reassuring and there is certainly an appetite for a project of this kind in the community.